40th anniversary of Vietnam reunification. 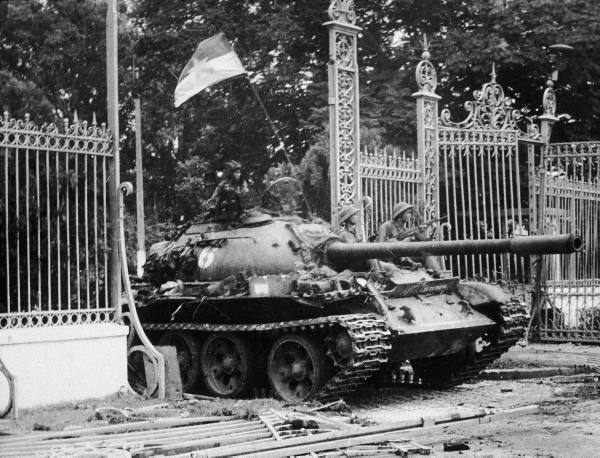 This date (April 30, 1975) marks the 40th anniversary of the day North Vietnamese tanks rumbled through the streets of Saigon and broke through the fence at the Presidential Palace to formally re-unify North and South Vietnam. Today, this action is called Reunification Day (Ngày Thống nhất) and is a public holiday in Vietnam. This action signaled the bitter end of the “Vietnam War” (technically more of a “conflict”), known in Vietnamese as Kháng chiến chống Mỹ (“Resistance War Against America”). It was the start of the transition period beginning July 2, 1976, when the Provisional Revolutionary Government of the Republic of South Vietnam and North Vietnam merged to form the modern-day Socialist Republic of Vietnam. I bring this date up for two reasons. First, because I would like you to think just a little about Vietnam. It was one of the most important events in modern history, in many ways shaping the new millennium. But the Vietnam Conflict is quickly headed for obscurity if for no other reason than the exigency of our current nonsense conflict in Afghanistan. A war that can never be won by anyone, as the Russians previously proved in the 80s. It can be easily downloaded off iTunes as well. This is a very objective and important documentary because it vividly portrays the human aftermath of extremely bad political decisions. It is painful to watch but necessary to give a perspective to the human suffering that occurs following imperious political policy. The bad decisions of the French resulted in 1,726 killed in action and 1694 missing in action in about 6 months at Dien Bein Phu. The Russians were unceremoniously thrown out of Afghanistan after 13,310 soldiers had been killed, 35,478 wounded. Those lessons should have been heeded. I went back to Vietnam in 2011 after 43 years and I have some profound reflections on things pertaining to it. Vietnam has changed so radically and yet has so stayed the same. In 1968, the entire country was a big American military base. Many troopers never saw any of the cities or the rest of the country. Ankhe City didn’t exist. Camp Radcliff dwarfed the entire region. Same for Camp Holloway In Pleiku, Camp Eagle in Phu Bai and endless others. In 2011, I saw the real country for the first time without the Army green and camouflage that had obliterated every landscape. Therefore, that trip was much more of a simple tourist effort than a trip back in time. Many in my present reality were not alive in 1968. Coming back to that place was a much emptier experience than I had previously anticipated. Most or all of the areas where I Iived my life are no longer recognizable. I felt no particular clarification or verification of any of my life as a result of going back to the past. Whatever I might have been seeking has eluded me. Thomas Wolff was right on more accounts than one; you can’t go home again and you can’t go back in time to re-live either. Trust me, I have tried. Perhaps I yearn for a “Somewhere in time” where Chris Reeves desires to go back so intensely and approximates himself into a time warp so accurately it actually happens and he is given another chance at another path to take. But alas, in the end it might be possible to have it transiently, but the coin always lurks that brings it all tumbling down. And so we come back to the clearing at the end of our road and make what we can of it.